As my mother got older, she became impatient with longer prayers, reverting at times to sing-song children’s rhymes as table grace. I find myself, sometimes, wanting to rush through a mealtime prayer, especially if my eggs are getting cold. But God, we know, takes food seriously. He starts us out in a garden, then promises His people a land flowing with milk and honey, and finally holds before his children the promised Marriage Supper of the Lamb. Even now this promise is represented at the Lord’s Table—sharing bread and wine to remember the sacrifice of His Son and to anticipate His return, one of the most ubiquitous and meaningful experiences of our life together as believers. Food is more than imagery, of course. It is not just a metaphor, but a real, tangible, and necessary thing. We pray, as Christ taught, for our daily bread. And for millenniums we have worked for and prayed for it in ways that are easy to forget, given the distance between our tables and our fields. The most helpful aspect of the slow, organic, local food movement perhaps is the call to see the connection between the food we eat and the land that sustains us. “Eating is an agricultural act,” as Wendell Berry puts it. But that’s not quite far enough, as Berry acknowledges in his essay on “The Pleasures of Eating.” The real connection is between the food we eat and the God who gives it to us. That strikes me as the connection He always intended. 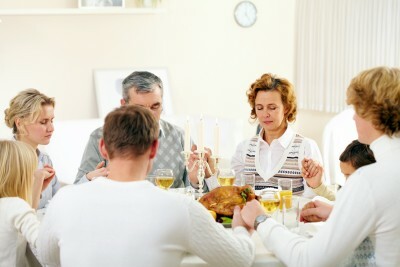 Our thanksgiving, unfortunately, is either ritual or rare. Perhaps both. For evangelicals especially, nothing comes as close as quickly to the vain repetitions of which Christ warned. A cursory nod, perhaps, to the cook, and maybe to the strength we might gain. But even the devout often give thanks with no consideration to the rain, the soil, the farmer, the harvest, or even the taste. There is no awe of the miracle, especially if it comes in a box. This is a great loss. To the degree the “real food” movement helps us celebrate the textures, and odors, and tastes of our food, we move in the right direction. But this can easily turn to pride instead of gratitude, as we congratulate ourselves on our ability to buy it, cook it, or even recognize it. You don’t have to be a hipster or a foodie for this to happen, however. You can buy your food at a discount grocer in a box or grow it outside your backdoor and still forget the connection to your Provider. You can be as proud of your thrift as you are of your good taste. It’s no great feat to see better food as good. I commend those who remind us it tastes better and is better for us. But to see food as holy? Well, that’s a miracle too. I so get this, Wally. Food IS such a sacred thing … and not only the act of eating (which is sustenance) …even beyond the rich biblical metaphor we hear so often in the church. Gathering people around us — those we love, those we treasure, and those who are strangers — and breaking the proverbial bread is an act of spirit, done with the example of Jesus in mind. For me, even the preparation of the food is literally an “act of spiritual service.” I love the process, the creativity, and the “study” of cooking, and to prepare food that people enjoy, that nourishes their bodies and minds and emotions is very, very rewarding. To me, preparing and eating good food melds the spiritual and the physical in a way few other things can. It echoes of the “fully human, fully God” incarnation, feeding both sides equally. Very thought provoking post. Thank you! What intrigued me most here was the mention of “a benediction at the end” of a meal. Many times after I have eaten I have noticed that I have to reflect back to the Lord a simple “Thank you!”, a recognition that was I just finished eating was from Him. Does anyone else ever notice this? I just thought I would ask. Rarely does one pray after a meal, something I have reflectively thought about when the Holy Spirit seems to alert me to in those subtle quiet moments. I think Benediction should be much more part of our experience–so many times and ways to do this. Previous Previous post: What would Jesus eat?